Could you or would you ever choose to live a little house that is a 15 X 15 foot square? This is not the classic American Dream by any stretch of the imagination. The big McMansion is our cup of tea. Did you ever drive by a new “development” of McMansions and wonder if anyone was home? And wonder about how big all those mortgages were? And wonder if both the mom and dad were working long hours to pay the mortgages. And imagine that all the young kids were at day care, maybe subconsciously feeling kind of adrift because mom and dad had left them in this strange playland. And now, thanks to the pervasiveness of American-made media, the Dream is shared in every corner of the globe. So one last question: Is this kind of American Dream going to get us to the post 2012 Golden Age? I have my doubts. I gave a presentation to a Cub Scout troop last week. 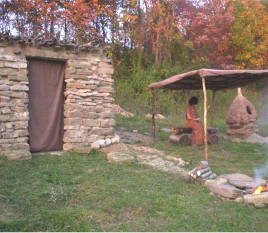 I showed them a picture of my root cellar home and told them about the Ancient Village that I helped to build in Ohio in order to demonstrate how earlier generations lived close to the land. I explained that when you live in a very small house that is surrounded by Nature, you end up spending a whole lot of time outside. The cramped quarters of a little house are ideal for sleeping and storing a few precious items. Clutter, the bane of modern housekeeping, is not an option. Living outside, I suggest, breeds a hearty, hardy constitution. Consistent exposure to the natural, seasonal changes in weather conditions a body to tolerate greater extremes. Not to mention the virtues of fresh air. And there are transcendent, spiritual gifts–too numerous to mention right now–that accompany a life within the Natural world. The Ancient Village is a part of Friendship Village International Conference and Retreat Center located about two hours south of Cleveland. I’ve spent years cultivating a vision of the Golden Age to come while spending time at Friendship Village, a world apart from the “rat race”. I do wonder. What is the collective unconscious of humanity brewing for humanity? What is our Ideal Scene for the future? What kind of homes will we live in? What kind of relationship will we have with Nature? Where will we put all our trash? Ouch! It’s all mind boggling! But still I keep the faith that SOMETHING will happen to change the course of history and make MY Big Dream of a Golden Age for humanity come true. In that Golden Age we won’t necessarily HAVE TO live in little houses. But I know we will have to re-create an intimacy with Nature….and with Nuwati, the Power that resides in the All, the complete Authority in Nature…the Source of All Life; Medicine. This entry was posted in Wellness and Spirituality. Bookmark the permalink.